The story of the hapless and demented young Dinorah roaming the hills with her goat, Bellah. This charming three-act opera was a surprise in 1859 for those critics who thought Meyerbeer capable only of large-scale grand operas. In fact, it became one of his most popular and enduring works. 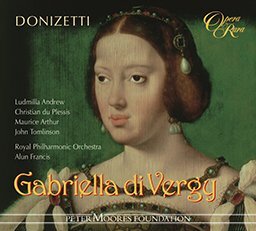 The story of the hapless and demented young Dinorah roaming the hills with her goat, Bellah, was a favourite of the diva Adelina Patti. 03 Dinorah, “Le pardon de Ploermel”: Act I scène II: Bellah! Ma chèvre cherie! 06 Dinorah, “Le pardon de Ploermel”: Act I scène III: Aria: J’en rougirais, eh bien! Apres! 07 Dinorah, “Le pardon de Ploermel”: Act I scène III: Qui va la? C’etait le vent! 08 Dinorah, “Le pardon de Ploermel”: Act I scène IV: Duet: Sonne, sonne, gai sonneur! 09 Dinorah, “Le pardon de Ploermel”: Act I scène V: Hola! He! Vieil Alain! 10 Dinorah, “Le pardon de Ploermel”: Act I scène V: O puissante magie! Ivresse de mes sens! 12 Dinorah, “Le pardon de Ploermel”: Act I scène VI: Si tu crois revoir ton père éxpirant ? 13 Dinorah, “Le pardon de Ploermel”: Act I scène VI: Duet: Un tresor! 16 Dinorah, “Le pardon de Ploermel”: Act II scène II: Aria: Dites-moi, dites vite; a-t-on vu Dinorah? 17 Dinorah, “Le pardon de Ploermel”: Act II scène III: Aria: Me voici! Me voici! 20 Dinorah, “Le pardon de Ploermel”: Act II scène V: Aria: Ah! Que j’ai froid! 21 Dinorah, “Le pardon de Ploermel”: Act II scène VI: C’est toi? Non, je frissonne! 23 Dinorah, “Le pardon de Ploermel”: Act II scène VII: Tu fremis? Que m’importe! 24 Dinorah, “Le pardon de Ploermel”: Act II scène VIII: Trio: Taisez-vous! 26 Dinorah, “Le pardon de Ploermel”: Act III scène I: Aria: En chasse, piqueurs adroits! 29 Dinorah, “Le pardon de Ploermel”: Act III scène I: Quartet: Bonjour, faucheur! 33 Dinorah, “Le pardon de Ploermel”: Act III scène IV: Duet: Vois! ? regarde ces lieux! 34 Dinorah, “Le pardon de Ploermel”: Act III scène IV: Sainte Marie! Dinorah is sheer delight ... 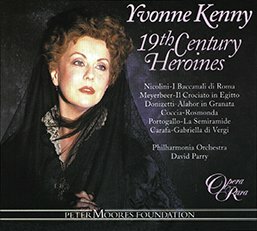 This recording adds up to more than the sum of its parts and we should be grateful to Opera Rara and the sponsor, the Peter Moore Foundation- for bringing such rare, illicit pleasure. 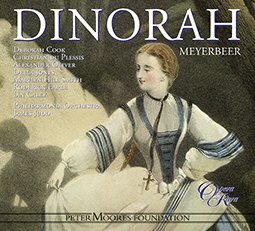 This is a fascinating and valuable recording that demonstras precisely why Meyerbeer was so highly admired by his contemporaries.